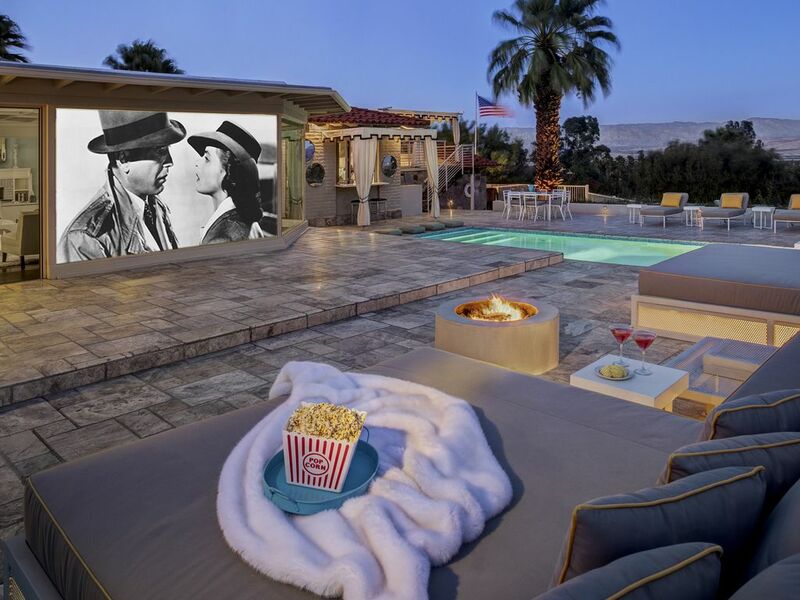 Architectural Digest Featured Estate offers Movie Nights Under the Desert Stars! Hamrick House continues to host families, celebrities, well respected political, sports, business and entertainment professionals, and numerous non-profit charitable foundation soirées. Models and several corporations such as Neiman Marcus, Ralph Lauren, Smith Hawken have created beautiful campaigns at the property. The home has been published in several design and travel publications. Architectural Digest has chosen this property as one of California's best designs with its classic style and timeless architecture. The Mediterranean/Spanish Revival home was designed by John Porter Clark and Albert Frey, local architects of national prominence. The property has been declared by the City of Palm Springs, permit #4586, a Class I Historic city landmark. Hamrick House is listed on the National Register of Historic Places by the National Park Service and the United States Department of Interior. The very best of Palm Springs is offered in this home, featuring five spectacular suites and five private en-suite luxury bathrooms. Nestled on a hillside with 360 degree views of Palm Springs, the Coachella valley, as well as, unobstructed views of the San Jacinto Mountains. Amenities include complete privacy behind tall hedges and security gates, an award winning pool and spa with custom water shelves, an incredible upper sun deck offers a queen size bed overlooking the city, valley and mountains. Pool floats, board games, mountain bikes, custom designed ping pong table, streaming HD televisions throughout, extensive book collection. Regency-style cabana poolside, secure wireless Internet, state of the art security monitoring, steam shower, outdoor sun beds and showers, Viking cooking appliances, white carrara marble in the kitchen and bathrooms. Interior living space is approximately 3580 square feet in five private suites. Exterior living space is approximately 4500 square feet, for a combined living space of more than 8000 square feet. The comprehensive Owner's Guest Guide offers our personal recommendations on restaurants, activities, as well as, property amenities. Available daily, weekly and monthly. 2 Kings, 3 Queens. Concierge services are included with all confirmed reservations to assist our Guests with scheduling restaurant reservations, on site massages, private yoga instruction poolside, as well as services of our private chef, any desired grocery provisions, daily housecleaning, and/or auto detailing. Please inquire for more information. Pets are optional. Certain restrictions apply. Noise ordinance compliance required. Occupancy confirmation required. The owner is Boston-born architectural designer specializing in the acquisition, restoration, and landmarking of historic properties. He has managed properties and been involved in real estate investing for more than a quarter of a century. Mark Anthony has a B.A. from Pepperdine University and an M.A. from Emerson College. His husband works in the medical device industry and has a B.A. from the University of Minnesota. Hamrick House, is named after the Pacific Northwest family that commissioned architects Albert Frey and John Porter Clark to design one of their first residential commissions. The Palm Springs City Council has designated the property a Class I Historic Landmark. Hamrick House is listed on the National Register of Historic Places by the National Park Service and the United States Department of Interior. toilet, combination tub/shower, tub, jetted tub, Dramatic head on city and mountain views. toilet, combination tub/shower, tub, shower, jetted tub, outdoor shower, Carrera marble, steam, desk area, private terrace. All five bathrooms are beautifully appointed in Carrera marble. Some amenities in the bathrooms include:, jacuzzi tubs, steam shower, direct access to pool terrace, private sunning areas. All bathrooms offer dramatic head on city, valley, and mountain views. Palm Springs Aerial Tramway, Palm Springs Art Museum, Palm Springs Architecture Museum, Annenberg Estate--www.sunnylands.org, Morten's Botanical Gardens, Design District Shopping less than 5 minutes. Riviera Resort less than 5 minutes as well as several Colony Palm Resort among others. Thursday nights downtown village open street fair . Guest Guide offers more detail. Available for local calls and to access the gates. Central HVAC with individual thermastat controls in each bedroom as well as air purification system. High thread count sheets are freshly pressed in each of the five bedroom suites. Frette large bath towels and washclothes are offered in each of the private ensuite bathrooms. Commercial size HE Whirlpool Duet washer. Detergent, softener, dryer sheets provided. Only HE Detergent may be used. Commercial size Whirlpool Duet dryer. Detergent, softener, dryer sheets provided. Ample parking within property gates. No street parking is permitted at any time, per city regulations. Car detailing available upon request. Not available for parking. Auto detailing available upon request. Inquire about details at time of booking. Secure wireless network. Passcode offered at check in by property manager. Frette bath towels. Pool and bath towels provided. Upper sun deck has weight bench and yoga mats are provided along with instruction upon request. Secure high speed Internet with Commercial Router to stream multitude of devices. Published in Architectural Digest for its classic style and timeless design. Four leather wingback chairs highlight this space, carrera marble fireplace, built in bookshelves, dramatic city views. Professional dishwasher offers quick smart cycle and is the quietest dishwasher available on the market today. Professional refrigerator offers filter water dispenser. Viking beverage and wine cooler located inside kitchen island. Viking outdoor refrigerator located in our garage for additional needs. Viking 6 burner Professional stove. Outdoor BBQ by Viking for the very best in cooking and grilling. Private chef on staff available to cater all meals. Property is well stocked with White Coupe Service for 12 and utensils for the gourmet chef in your party. Published in Architectural Digest, our classicly designed kitchen seats 10, feature Viking appliances, Carrera marble, dramatic city, valley, and mountains views, flat screen tv, apx 4' x 8' island. Seats 10 comfortably in Philippe Starck lucite ghost chairs. The dining room offers head on city, valley and mountains views. Additional outdoor dining offers 6 chairs and two bar stools. (7) Flat screens along with HD Movie Projector which connects directly to Guests laptop for Streaming Movies. High-definition cable television including CNN, Bravo, HGTV, ESPN 2, among many other networks is available in all five suites, some bathrooms, kitchen, media room, as well as upper sun deck. Extensive media, surround sound iPod and bluetooth offered. Noise ordinance is strictly enforced. Extensive collection of movie titles. Extensive library more than 500 books on architecture, design, biographies, travel. Media room of the living room offers collection of board, card games, library, as well as many dvd movies. Board games, card games inside left built in of media room. Outdoor custom ping ping table with paddles and balls. Many pool floats and toys located in garage. Streaming services available on all televisions including Spectrum Digital. Property sits on almost an acre with mutliple sitting areas. Ping pong area. Upper sun deck area offers dramatic head on city, valley and mountain views. Queen sun bed, and two chaise lounges as well as outdoor television during high season. Nice mountain bikes and a tandem Cannondale. Guest may need to inflate tires. Pump provided. Approximately 4500 foot rear stone terrace with multiple sitting areas, dramatic city, valley and mountain views. Upper sun deck offers retractable roof, draperies, sun bed and spectacular views. Pool floats provided. Stored in garage. Property is on one level, with the exception of a few interior and exterior steps, please inquire if special requirements are required. Palm Springs is now a resort of all ages and diversity is celebrated. Master bathroom has steam unit with surround sound bluetooth speaker. Pool service is twice weekly. Higher temperature requests available prior to arrival, please inquire. Award winning pool and spa offers soaking water shelves and six dramatic deck jets. Custom spa offers booster jets along with dramatic city, unobstructed mountains and down valley views. Spa heats almost immediately with new commercial grade heater at the touch of one button. Palm Springs finest view home is available with a minimum two night stay. Set on almost an acre in exclusive Little Tuscany Estates, the Bel-Air of Palm Springs, and built for motion picture magnate John Hamrick, the home was designed by noted architects John Porter Clark and Albert Frey. This architectural masterpiece offers spectacular head on city, valley, and unobstructed San Jacinto mountain views. Interior of home is approximately 3580 feet, on one level, with a rear stone terrace of approximately 4500 feet, which abuts natural desert landscape. Some amenities include: Outdoor movie theater with surround sound, high thread count linens, Viking kitchen, white carrera marble in bathrooms and kitchen, heated salt-water pool with deck jets and spa, secure wireless Internet, retractable roof, regency style cabana. Massage, yoga, private chef, daily maid, grocery provisions, and auto detailing available upon request. Amazing house with incredible views. The owner, Mark, is the ultimate host. Very spacious. Can’t wait to rent the house again. Hamrick House is a dreamy, incredible place. The view and property are WOW-worthy, and everything you could want or need is at your fingertips. Mark, the owner was warm, accommodating and helpful. He sent loads of information prior to our stay that helped me plan a wonderfully memorable trip. He was easy to reach and helped make sure we were beyond taken care of. We truly could not have felt more at home at Hamrick House. We could not have had a better stay, and are planning on returning in the future! Thank you Mark! Thank you for your kind words. Hamrick House is truly a slice of heaven and we are grateful to be able to share it with wonderful repeat guests like yourself. We look forward to welcoming you back in 2019! The Hamrick House is absolutely georgeous! From the moment we pulled into the private gates of the estate, we were astounded by the open air and scenic views from this home. Every bedroom was well accommodated with all of the luxuries of a five star hotel. Palm Springs and cocktails go hand in hand and the open bar seating off the kitchen overlooking the pool was the perfect place to pass drinks to my guests. Every detail of this house has was fully thought out and truly makes your vacation less stressful and more relaxing. The Hamrick House is located in a quiet neighborhood that enables you to just take in the beauty of Palm Springs and its mountain backdrop. If you are considering traveling to Palm Springs, you must contact Mark at the Hamrick House. He will go out of his way to make sure your vacation needs are met. One truly memorable experience. Heaven on earth! Palm Springs Best Luxury Rental Home~! Truly a special retreat. The city and mountain views are incredible. The entire property is even more beautiful in person. We are avid golfers, but spent most of our time relaxing and enjoying the house. The owner's attention to detail is remarkable. The guest guide was informative and helpful providing information on the home's history, local dining, and activities. We hope to return again next year. Thank you again Mark! The views were amazing, the beds super comfortable, loved the sheets and Frette towels. Our first visit during Modernism. We absolutely fell in love with this very special home. It is immaculately kept. Very close to beautiful hiking trails, great restaurants, and downtown. We biked, played ping pong, enjoyed reading (huge collection of books). Great Viking BBQ and super easy bluetooth wifi surround sound system. The outdoor movie experience was the best part! The house guide is through, informative, and useful. LOVED this home. Thank you again Mark! We will be back. Our property guest guide is up to date and offers valuable information as well as personal owner recommendations on activities, restaurants and amenities that are offered at our home. Celebrity home tours, Native Indian Desert tour, Aerial Tramway. Private massage, chef, yoga, daily maid service available, please inquire. Palm Springs Permit #4586 Spa heating is included in nightly rate. Pool heating is optional for nominal fee and price varies on guest needs. Concierge assistance is included with all reservations which includes making reservations at many local restaurants, auto detailing, massages, private yoga, and grocery provisions, hiking and shopping information. Optional early check in and late check out times available, inquire. Noise ordinance, non-disclosure, explicit occupancy must be agreed to with owner before reservation may be accepted. Day guests are optional for an additional fee. Overnight occupancy limit is 10 including children and names and ages required before acceptance of a reservation. Guests agree to complete check out procedures to mitigate any additional cleaning fees. Rates and availability are subject to change. Security deposit is higher for holiday and Coachella periods. Optional services must be arranged at time of reservation and include: private chef, yoga, massage, daily maid cleaning, grocery provisions. Security deposit varies depending on specific dates and duration of stay.